Social game companies Renatus Media and Clonefish are experiencing growing success with their bubble-popping game Bubble Chronicles: Diamond Edition (DE) on Facebook. The game sees players traveling throughout time, bursting bubbles in Ancient China, the Jurassic period and more. Since gamers have traveled to the past using their time machine, each shot of a bubble costs some fuel from the machine to fire. The more levels players complete, the faster their fuel regenerates going forward, which offers huge incentive to keep playing in order to increase that fuel recharge rate. 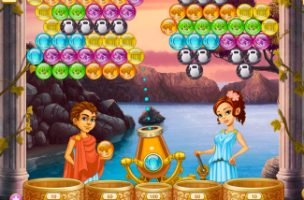 Players are also given bonus fuel for interacting with the game’s fan page, or posting progress updates to their news feed. Eventually, players unlock power-ups to help them out of tough situations. These may increase the shot trajectory line, or cause large explosions that clear bubbles from the screen (as examples). Users can also purchase a variety of time machine upgrades with real money, which impact their fuel consumption. Bubble Chronicles: Diamond Edition is available to play for free on Facebook. The game has over 469,000 monthly active users, according to AppData.